The role of a server operating system is shifting, influenced by cloud computing (whether public or private) and virtualisation. A server is more often a virtual machine (VM) that can be created in minutes and replaced rather than repaired if it fails, than the carefully configured multi-purpose box that was once common. 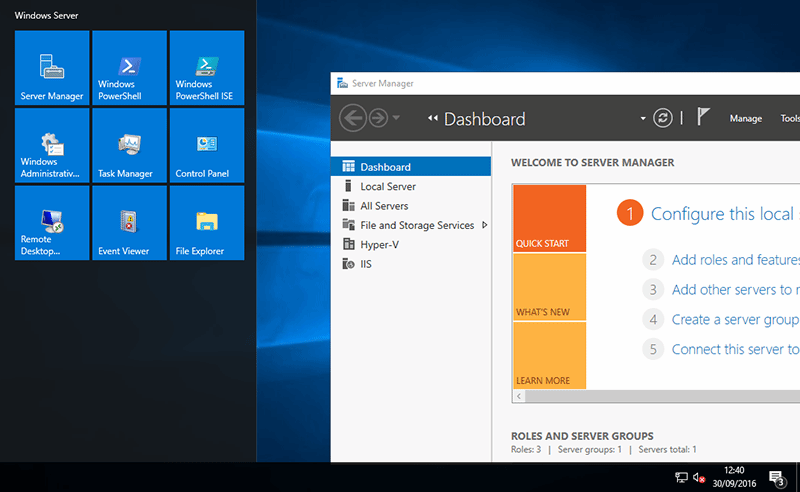 Windows Server 2016 is a major release, with more changes than in Windows Server 2012 R2 back in 2013. It is designed to address the themes at top of mind in today’s IT landscape: security, automation, virtualisation, software-defined networking and software-defined storage. Please confirm me if after installing WS2016 in my Windows 10 Laptop I will see the same above results after following above recommendations. Microsoft announces in Ignite 2016 OneDrive and SharePoint work together. It will make file easy and powerful to store and access. Office 365 added new features easy file sharing, copy files directly from OneDrive to SharePoint, Office Setup 365 files mobile access on iOS and the new discovery view that recommend related and trending files with the use of Microsoft Graph. New sync capabilities include in update now Preview available of OneDrive folder and SharePoint document can sync which share with you. Now you can view sync file activity in a glance for this an “activity center” added in OneDrive. New browser capabilities include 20 file types’ rich thumbnail previews, access and edit one drive and SharePoint files in OneDrive browser also download multiple files as a .zip file also include these update available before the end of 2016.